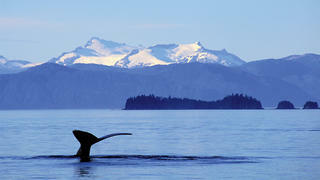 Alaska is a cold destination you must explore with the Sanlorenzo 460EXP. 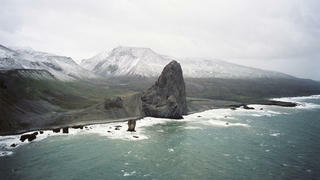 The string of islands that stretches into the Bering Sea offers nature lovers the chance to witness wildlife up close. It’s also a daring cruising ground since this is where the Gulf of Alaska and North Pacific Ocean meet, often resulting in rough seas. The Sanlorenzo 460EXP’s outstanding seakeeping and stability make her the perfect superyacht for taking you further into the wilderness than ever before, and in the ultimate comfort. Nowhere is this better demonstrated than in Alaska, home to some of the wildest scenery in the world. With large windows and ample deck space offering superior views, the Sanlorenzo 460EXP gives you the chance to watch wildlife in stunning comfort. Lounge on deck and watch pods of orca, or grab a pair of binoculars to witness bald eagles take flight, or brown bears roam the shore. Alaska is a cold destination you must explore with the Sanlorenzo 460EXP. 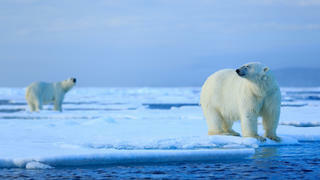 The string of islands that stretches into the Bering Sea offers nature lovers the chance to witness wildlife up close. It’s also a daring cruising ground since this is where the Gulf of Alaska and North Pacific Ocean meet, often resulting in rough seas. The Sanlorenzo 460EXP’s outstanding seakeeping and stability make her the perfect superyacht for taking you further into the wilderness than ever before, and in the ultimate comfort. Nowhere is this better demonstrated than in Alaska, home to some of the wildest scenery in the world. With large windows and ample deck space offering superior views, the Sanlorenzo 460EXP gives you the chance to watch wildlife in stunning comfort. Lounge on deck and watch pods of orca, or grab a pair of binoculars to witness bald eagles take flight, or brown bears roam the shore. One of the best reasons to visit Greenland is to enjoy its pristine habitat. Responsible yacht owners are increasingly aware of the need to ensure visiting superyachts don’t compromise the environment, and only one that is classified as environmentally friendly will do. Thankfully, the Sanlorenzo 460EXP is just that – and has been classified as Green Plus by RINA. Aside from the scenery, the Northern Lights are a big draw for visiting yachts. It’s said the sky puts on this amazing light show up to 300 nights a year this far north, so visiting yachts will not be disappointed. Greenland has a rich history and habitat that’s home to musk ox, polar bears, walruses, caribou, fox and plenty of other Arctic wildlife, which means there’s no shortage of things to do. But, of course, there’s ample entertainment on board the Sanlorenzo 460EXP too – whether that’s splashing around in her pool, relaxing in the beach club or unwinding with the yacht’s comprehensive entertainment systems. One of the best reasons to visit Greenland is to enjoy its pristine habitat. Responsible yacht owners are increasingly aware of the need to ensure visiting superyachts don’t compromise the environment, and only one that is classified as environmentally friendly will do. Thankfully, the Sanlorenzo 460EXP is just that – and has been classified as Green Plus by RINA. Aside from the scenery, the Northern Lights are a big draw for visiting yachts. It’s said the sky puts on this amazing light show up to 300 nights a year this far north, so visiting yachts will not be disappointed. Greenland has a rich history and habitat that’s home to musk ox, polar bears, walruses, caribou, fox and plenty of other Arctic wildlife, which means there’s no shortage of things to do. But, of course, there’s ample entertainment on board the Sanlorenzo 460EXP too – whether that’s splashing around in her pool, relaxing in the beach club or unwinding with the yacht’s comprehensive entertainment systems. Patagonia is one of the most appealing destinations for adventurous travellers, who feel the draw of this mysterious land of fire and ice and its endless opportunities to explore. With serious amounts of space on the Sanlorenzo 460EXP devoted to housing toys, there’s no limit to what you could do. 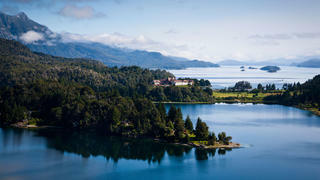 One day you could be flying a seaplane over the breathtaking waterways and the next you could be diving to the depths of places like Lake Nahuel Huapi, with its incredible submerged forests, or take Seabobs to swim with sea lions on the coast. You could also tender to Magdalena Island to see the 150,000-strong penguin colony that settles there between October and April each year and encounter dolphins on the journey, or follow in the footsteps of explorer Charles Darwin and his ship HMS Beagle by cruising the coastline and rounding Cape Horn. Patagonia is one of the most appealing destinations for adventurous travellers, who feel the draw of this mysterious land of fire and ice and its endless opportunities to explore. With serious amounts of space on the Sanlorenzo 460EXP devoted to housing toys, there’s no limit to what you could do. One day you could be flying a seaplane over the breathtaking waterways and the next you could be diving to the depths of places like Lake Nahuel Huapi, with its incredible submerged forests, or take Seabobs to swim with sea lions on the coast. You could also tender to Magdalena Island to see the 150,000-strong penguin colony that settles there between October and April each year and encounter dolphins on the journey, or follow in the footsteps of explorer Charles Darwin and his ship HMS Beagle by cruising the coastline and rounding Cape Horn. Visiting superyachts are few and far between in the Lofoten Islands, but those that do cruise this Norwegian archipelago are blessed with some of the most incredible animal encounters. The wildlife in such secluded areas can be scared away by noise pollution, but that’s not a concern with the Sanlorenzo 460EXP. She can remain anchored for long periods without using her generators, reducing noise and vibration at anchor and greatly improving the chances of making that magical encounter with sperm whales, orcas, sea eagles and dolphins. The Lofoten Islands are also known for stunning sunsets, which can be watched in supreme comfort from the numerous lounges on the Sanlorenzo 460EXP. 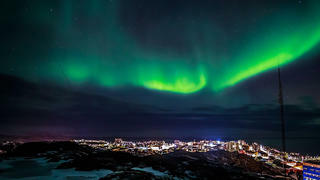 And, as befits a destination in the high latitudes, the Northern Lights are guaranteed to put on a show. For those who love to keep fit, after a workout in the yacht’s gym, the mountains are only a short tender ride away, offering challenging hiking. Then it’s back to the yacht’s sauna and Turkish bath to recuperate. Visiting superyachts are few and far between in the Lofoten Islands, but those that do cruise this Norwegian archipelago are blessed with some of the most incredible animal encounters. The wildlife in such secluded areas can be scared away by noise pollution, but that’s not a concern with the Sanlorenzo 460EXP. She can remain anchored for long periods without using her generators, reducing noise and vibration at anchor and greatly improving the chances of making that magical encounter with sperm whales, orcas, sea eagles and dolphins. 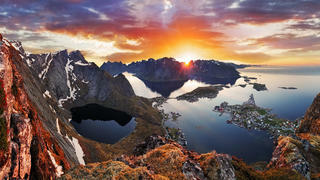 The Lofoten Islands are also known for stunning sunsets, which can be watched in supreme comfort from the numerous lounges on the Sanlorenzo 460EXP. And, as befits a destination in the high latitudes, the Northern Lights are guaranteed to put on a show. For those who love to keep fit, after a workout in the yacht’s gym, the mountains are only a short tender ride away, offering challenging hiking. Then it’s back to the yacht’s sauna and Turkish bath to recuperate. True explorers will be wildly tempted to visit the sub-Antarctic Kerguelen Islands in the middle of the Indian Ocean, accessible only by boat. This desolate archipelago is home to a serious scientific research base and visitors are restricted to a handful of places on just a few tours each year. The climate and extreme topography of these volcanic islands make access difficult, and therefore the perfect place to explore with the helicopter stowed on the Sanlorenzo 460EXP. Visiting such secluded destinations is exactly what this explorer yacht was designed for, offering the comfort and security in places as stark as Kerguelen Island, where tourists and holidaymakers are few and far between. True explorers will be wildly tempted to visit the sub-Antarctic Kerguelen Islands in the middle of the Indian Ocean, accessible only by boat. This desolate archipelago is home to a serious scientific research base and visitors are restricted to a handful of places on just a few tours each year. The climate and extreme topography of these volcanic islands make access difficult, and therefore the perfect place to explore with the helicopter stowed on the Sanlorenzo 460EXP. Visiting such secluded destinations is exactly what this explorer yacht was designed for, offering the comfort and security in places as stark as Kerguelen Island, where tourists and holidaymakers are few and far between. Located halfway between Norway and the North Pole, the frozen realm of Svalbard, where polar bears roam, is very much an ice destination. Thankfully the season to see polar bears coincides with the summer, when the archipelago starts to melt and yachts can access the island more easily. The hull of the Sanlorenzo 460EXP can withstand such strains, if the Ice Class option is selected, making this a superyacht than can truly travel the world and get you closer to some of the 3,000 polar bears that make Svalbard their home. But it’s the explorer yacht’s self-sufficiency that really comes into its own in places such as Svalbard, where you won’t expect to be stopping off to provision. She has a range of more than 4,000 nautical miles and boasts plenty of volume inside to give each guest their own space on long voyages – something the owners of the first Sanlorenzo 460EXP say they are delighted with. Located halfway between Norway and the North Pole, the frozen realm of Svalbard, where polar bears roam, is very much an ice destination. Thankfully the season to see polar bears coincides with the summer, when the archipelago starts to melt and yachts can access the island more easily. The hull of the Sanlorenzo 460EXP can withstand such strains, if the Ice Class option is selected, making this a superyacht than can truly travel the world and get you closer to some of the 3,000 polar bears that make Svalbard their home. But it’s the explorer yacht’s self-sufficiency that really comes into its own in places such as Svalbard, where you won’t expect to be stopping off to provision. She has a range of more than 4,000 nautical miles and boasts plenty of volume inside to give each guest their own space on long voyages – something the owners of the first Sanlorenzo 460EXP say they are delighted with.